The session received a very good reception, and I thank-you – the community for the same. Last week, I also discussed a question that was asked to me during the session – “How can I deploy a template to all of my developer workstations?”. While writing last week’s post, I noticed that some things had changed in SQL 11 (Code Named: “Denali”) CTP01 when compared to SQL 2008 as far as the available templates are concerned. The immediate difference is that SQL 11 CTP01 does not have a shortcut key for the Template Explorer. Ctrl+Alt+T no longer works with Denali. SQL 11 (Code Named: “Denali”) CTP01 comes with new templates! 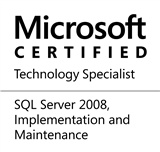 SQL 2008 SSMS came with 367 templates, whereas SQL 11 CTP01 SSMS comes with 399 templates as of now. Here is a detailed listing of the changes. Please note that all of these may not be available in the RTM release, but it is safe to assume that this is a fair indication of the changes. I have not considered differences of default paths and/or white spaces. Brand new set of 38 templates added for SQL Azure database! I hope that you are as excited and looking forward to newer templates as I am. Do let me know if this helped you in implementing template explorer in your organization. This entry was posted in #SQLServer, Blog, Imported from BeyondRelational and tagged #SQLServer on May 30, 2011 by nakulvachhrajani.